I am a bit of a humbug when it comes to Halloween. To be sure, I always loved the thrill of dressing up and know that my kids are excited to do the same. Perhaps I’m just a “tired, old, Mom”. Or perhaps I possess a nostalgic longing for days gone past. When I was little, we scrounged together whatever costume we could muster. Our biggest excitement was running to the convent, first, to get our giant Slo-Pokes. Those were the best! Then, we, the four girlfriends, went traipsing through the neighborhood until one of the dads decided we were out too long and would come driving in a car looking for us. Now, we encounter Halloween for a month prior to the event! We have preschool parties and library parties and school parties, trick or treating at the mall, and even at the grocery store. Last night, there was an event at the grocery store. Lots of cute little kids collected candy at stations throughout the store. I just happened to be caught behind the lines at every turn. I even heard someone say “Have a good holiday.” I never really thought of Halloween as a holiday. Our pumpkins used to be the talk of the neighborhood. We would carve away, but not cut through the pumpkin to make our designs. We made silhouettes of the kids, the Cat in the Hat, famous people, you name it. This year – the kids, who wanted to, carved their own – simple jack-o-lanterns. So, am I a Halloween Scrooge? Maybe. Since waking today, I made a scratch pineapple upside down cake, did dishes and laundry, worked for 3 hours, drove downtown to pick up my daughter…. (and my husband did a whole lot of extra domestic stuff for me today! )…and now to make the one last healthy meal of the day…. PS. I added the above photo. It was a tag team effort with my 13 yo daughter Annie. She wanted to be Galinda/Glinda from Wicked. We were going to make scalloped edges, but time got in the way. It was also a bit difficult to handle 7 yards of fabric, so I did most of the sewing. 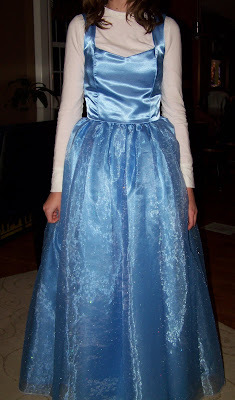 She was entirely thrilled with it – because who doesn’t want to be a princess? My 10 yo put his own costume together as a fighter pilot, my 16 yo daughter went as an angel and my 17 yo son went as John Lennon. They all had a great time! I got a little frustrated with the size of Halloween this year, too. At least it’s passed us by for this year! Now I just have to eat my way through massive amount of candy that is leftover! I often feel really relieved that Halloween isn’t the biggest deal where I live. Everything seems to be bigger bigger bigger everyyear (a sign I’m getting old maybe!). Also there’s an emphasis here (UK) on the “scary” costumes, witches/zombies/etc even for very young kids and I’m not that interested in going down the route of my children rolling themselves in fake gore. I love the dress, and your kids all chose ace costumes!